Every once in a while a movie comes around that breaks genre conventions and defines a generation. In 2010 director David Fincher (“Seven”, “Fight Club”) with the help of screen writer Aaron Sorkin (“Moneyball”) did just that; they gave us a movie that would forever define the millennial generation, for better and for worse The Social Network is a true masterpiece of filmmaking. I'm not going to write much about the 2010 Oscar upset surrounding this film (“The Kings Speech” won best picture over this film), it's proven itself over time as the better movie, and the Academy should still be hanging their heads for it. The Social Network on paper may seem a bit on the boring, it's the origin story of Facebook told from the perspective of the ones who created it, it's not a complicated story which works for its benefit, giving the audience the time it needs to understand the characters and their motives. This is a character based drama, with an overarching story to bring all of them together. The story unfolds with the characters seamlessly, every scene is filled with drama and revelations, uncovering a new piece of the character the view hadn't previously known. Whether it be secrets kept, or abusing chickens, each character even the minor ones are three dimensional, feeling wholly authentic and making even the most embellished scenes seem completely accurate. Obviously a film of such subject matter is going to have some facts either altered or fabricated for the sake of entertainment, and in this instance it's done masterfully by Aaron Sorkin, blending the real and the fabricated into an interesting, entertaining, and ultimately rewarding experience. David Fincher's movies have always had style, but here with The Social Network we see the director fully embrace his aesthetic, he finds his stride (which hasn't been lost) and hits the ground running. From the opening dialogue, to the crew race, to the intense courtroom-esque moments, and all the way to the inevitable conclusion this film oozes style. The cinematography is simple, but breathtaking, bringing everything important to the front of the screen all the while making the background alive, but not distracting. There's something so engaging about the way this film looks, the way the scenes flow and the dialogue is staged, every scene is filled with importance and demands full attention with each viewing, Fincher has not surprisingly latched onto this look, and has now become one of his many signatures, and gifts he's brought into the film world. The Social Network is when the world realized David Fincher is among the Hollywood elites and has only proved that with his following entries after this. Not only can David Fincher direct a scene, but he's also an actor director, he won't move on to the next shot unless it's perfect, and that could mean spending days on an eight minute scene of dialogue (the opening scene took a week to film). And while that might sound grueling for the cast and crew, it makes for a superior quality film, at least strictly speaking for Fincher's films. Each scene is crafted and molded to the way the director wants it curated, nothing comes out of the editing room without the David Fincher seel of approval. While this habit has made Fincher notorious, behind the scenes interviews and commentaries tell us that he has as much care for the actors and crew as he does for his films, he shows compassion for both, as without a cast and crew there would be no film and Fincher is more than aware of that fact. And with such intensity and compassion for his craft, it produces incredible performances to match the films superb style. With a style so bold and unlike anything else, it's only fitting to have an unorthodox soundtrack. Now regular collaborators, Trent Reznor and Atticus Ross bring their best feet forward and provide a score that will go down in the history books as one of the best film scores ever brought to life. From the simplicity of the opening theme, to the jarring remastering of 'In the Hall of the Mountain King' these two musicians give it there all, creating that much more of an atmosphere to really bring the whole picture together. Jesse Eisenberg (“Zombieland”) gives the best performance of his eclectic career, one that to this day he has yet to top. While I'm not sure how much inspiration or time he spent with the real Mark Zuckerberg, his interpretation of him to the screen is simply transformative. Eisenberg brings the character to the forefront without ever being overbearing. Zuckerberg in this movie is a tough one for an actor to portray, he's awkward, abrasive and for the most part fairly unlikable. There are moments where his quirks bring his character down to a level playing, but overall his character leaves a bit of a sour taste. Of course this is very intentional in both the script and performance, as it's juxtaposed beautifully by Andrew Garfield's (“Hacksaw Ridge”) performance of Eduardo, the co-founder of Facebook. Whatever personable trait Mark doesn't have, Eduardo does, he's the good cop persona against Mark's bad. Any scene with these two actors together is wonderful, their chemistry is cold and effective and it always brings the drama. From the intensity of the court scenes, to the humor and comradery early on during the creating process of Facebook, both actors prove to be a force. Armie Hammer (“Call Me By Your Name”) gives a great dual performance as the Winklevoss twins, who sue Mark Zuckerberg over intellectual property, creating another level of depth to the unfolding drama. And Justin Timberlake proves once again that he's just as good an actor as he is a musician, breathing life into the Napster founder, Sean Parker. With a phenomenal director comes great performances, fantastic writing, and an astounding final product. Overall The Social Network is a generation defining film, one that only comes around so often, telling a mostly true story about something that has effected a multitude of people from every varying demographic. I can't go on to say if this is David Fincher's best movie to date, but it's easily his most poignant and relative, even almost a decade later The Social Network is even more provocative and relevent than it was in 2010. Through the power of film David Fincher gives us an important history lesson, while being wildly entertaining, funny, and intense, focusing on and mastering his craft, solidifying his aesthetic for future projects to come. The performances are intense, intricate, and spot on, each one specifically written with their own agenda, there's nothing sloppy about Aaron Sorkin's writing, it's fast, it's exciting and it's just plain great. David Fincher has been pushing boundaries through his filmography, but The Social Network is where he fully breaks through. Creating his dense atmosphere with beautiful, stylish cinematography, with a masterfully perfect, ethereal score from two masters of the music industry. 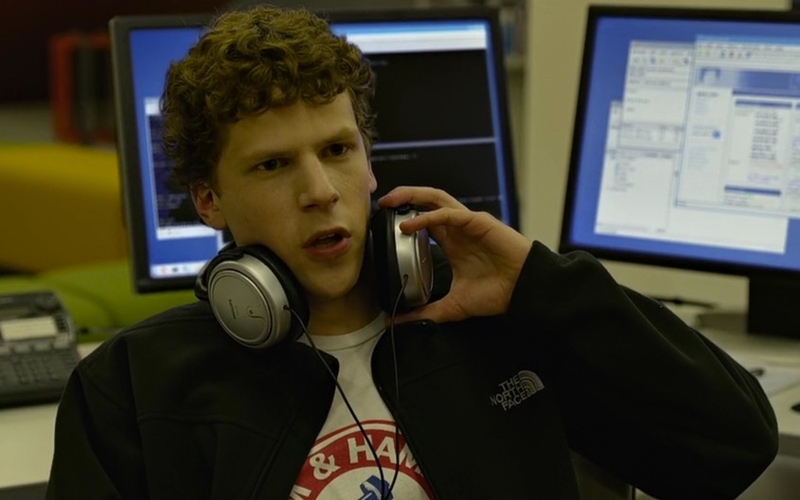 The Social Network not only stands the test of time, but proves that it only makes this film more important while the age of technology is ever growing. I give The Social Network 5 stars out of 5.